The single greatest guide to achieving success ever written, featuring a new foreword by Steve Harvey! 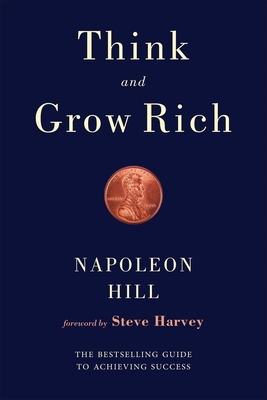 Think and Grow Rich, first published in 1937, took more than twenty years of research to compile. Napoleon Hill was a journalist and writer who later served as an advisor to President Franklin D. Roosevelt from 1933 to 1936. His big break came with his interview of Andrew Carnegie in 1908. Intrigued by Carnegie’s assertion that the path to success could be broken down into a simple yet comprehensive formula, Hill accepted Carnegie’s challenge to study and interview more than five hundred extremely successful individuals to determine to what they owed their vast achievements. This masterwork identifies thirteen principles that every person should adopt if they are serious about achieving successall are empirically based in the aforementioned decades of research. Hill has synthesized what wealthy and/or exceptionally successful individuals have in common. This classic guide is one of the bestselling books of all time, having sold twenty million copies by Hill’s death in 1970. With razor focus, desire, persistence, and perseverance you too can join the likes of Thomas Edison, Henry Ford, and Andrew Carnegie.